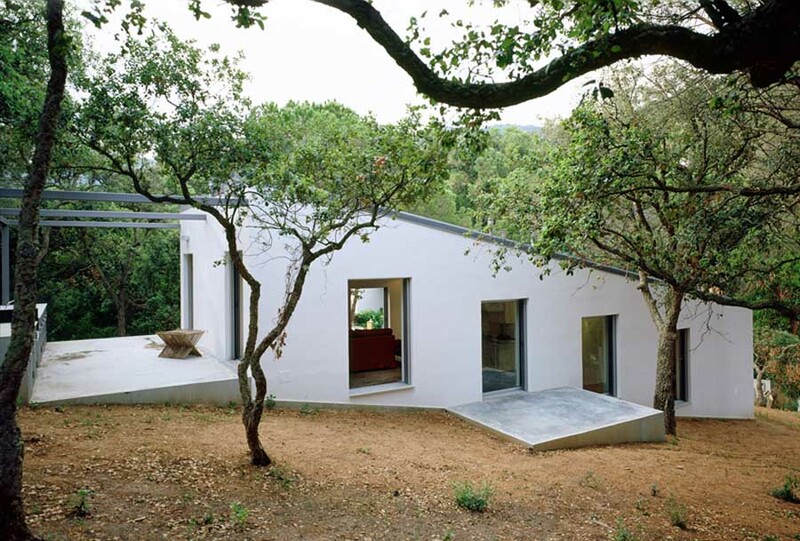 The clients needed a small restoration of a house built in 1983 and, specially, the creation of a new space to work. The building was very badly adapted to the land, the original topography. 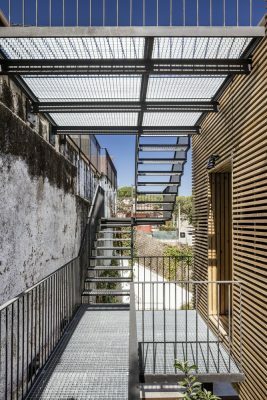 It was divided into two platforms separated by a retaining wall of 6 metres height. This wall generates a very important visual impact and provokes the isolation of two platforms. 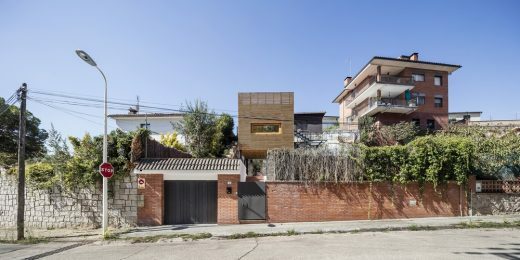 The house is located on the superior platform, which is built with ceramic brickwork without interest, with too many constructive solutions for the different façades. 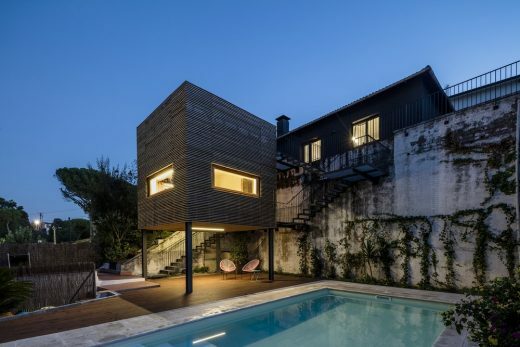 All its perimeter is surrounded by a narrow terrace, so with a limited use. On the inferior level there was a garden and a swimming pool in a bad condition. 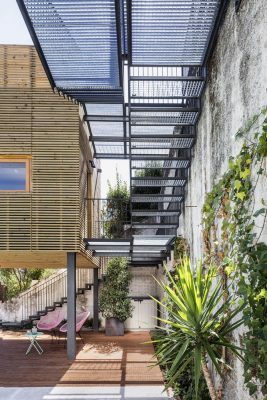 Although the exterior space had many possibilities to enjoy it, it was completely separated from the house by retaining wall and the two platforms were communicated by a simple stair not facilitating their use. 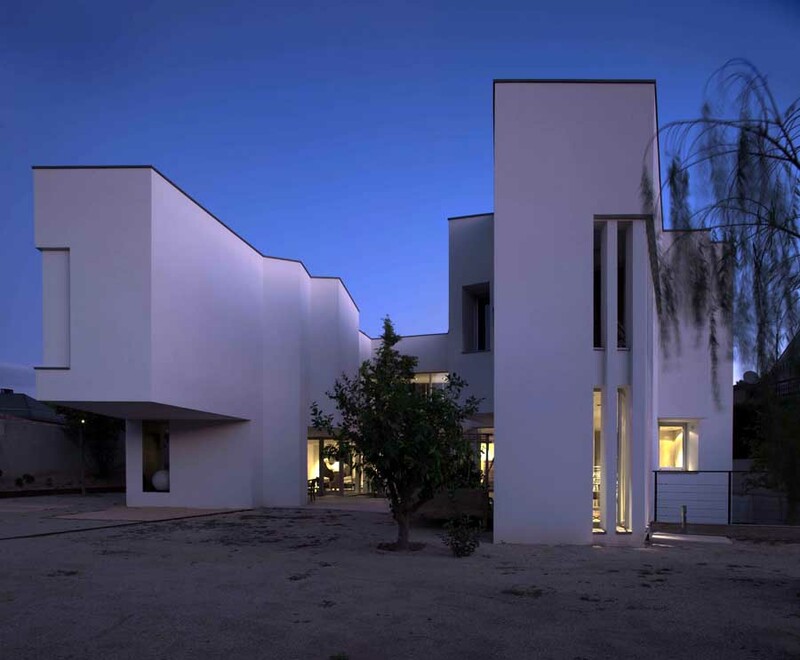 The aim of the project was to completely rehabilitate the building, adapting it to the clients’ requirements. The program set out to solve the segregation between the two platforms, creating a new connection with the main garden, that could decrease the visual impact of the retailing wall at the same time; and also generating a new space to work. 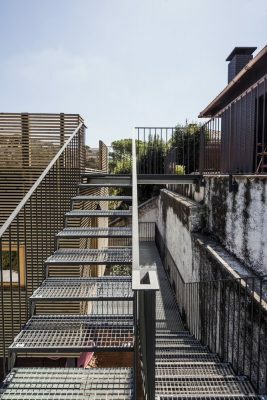 To achieve this transformation we have designed a light metallic stair that is separated of the retaining wall, generating a new level between the two platforms, where we have situated the new space to work. 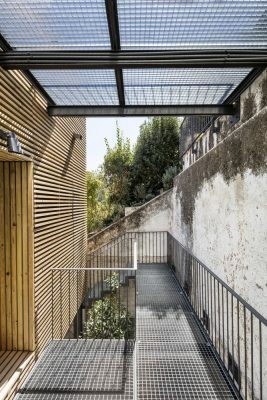 –	A new terrace at the level of the original house, that changes the use of the previous narrow one. 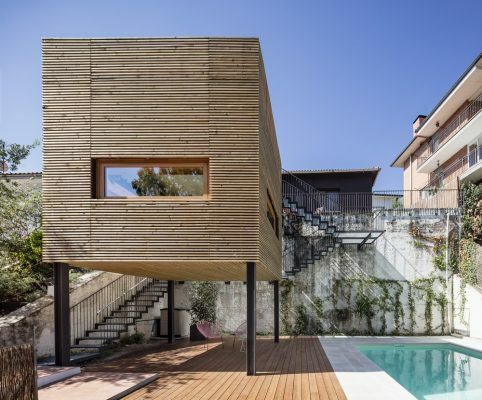 –	A new wooden volume, situated in the middle of the two old levels, creating a new studio directly opened to the main garden. It is an autonomous element and bioclimatic which it means, that it does not need heating or refrigeration. Such space is justified by its relative litheness and the desire to establish a provoking dialogue with the original structures. 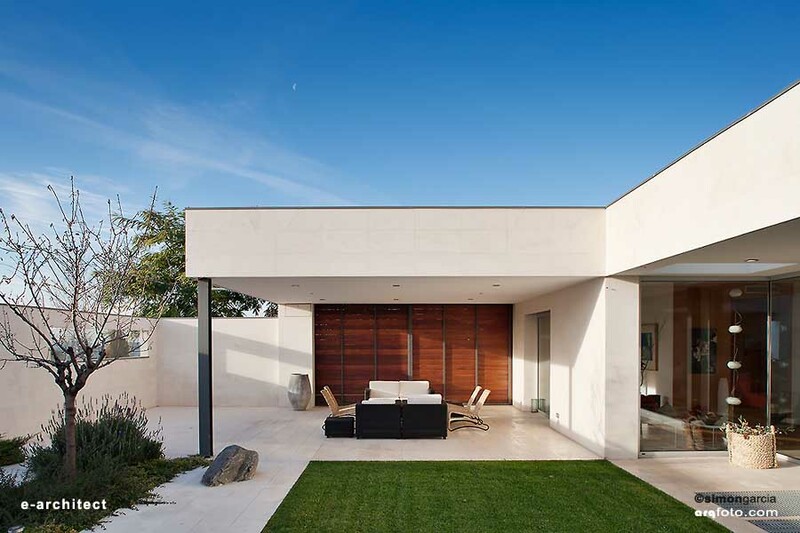 –	A new frame, a portico, situated at the level of the inferior garden, where the swimming pool is. 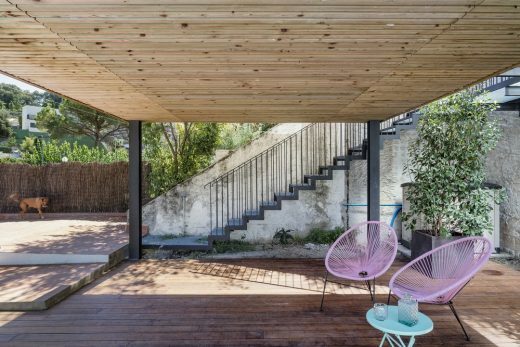 This space allows clients the possibility to enjoy of a sunny terrace. 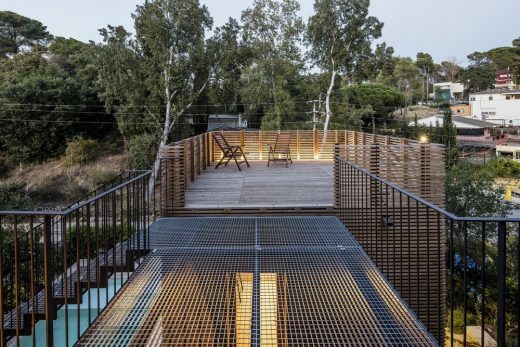 The new access to the main house is designed as a protruding balcony made by a simple rectangular angle iron that supports the galvanized rebar in order to generate a new exterior space full of nuances of shadows; and another more positive vision of the retaining wall. 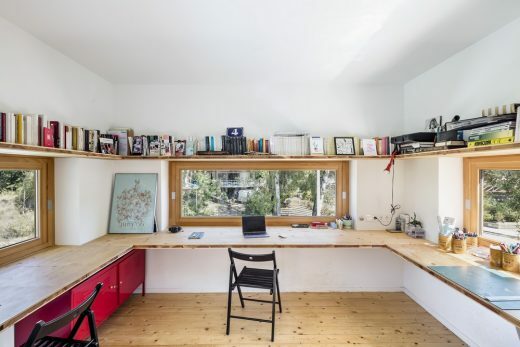 On the contrary, the new space to work is a compact wooden volume, separated from the inferior level by a metallic structure. 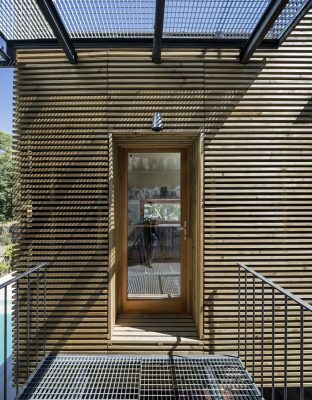 It is built with the frame System and the wooden slats of the facade provides a screen for preserving privacy, while also serving as solar protection in the summertime. 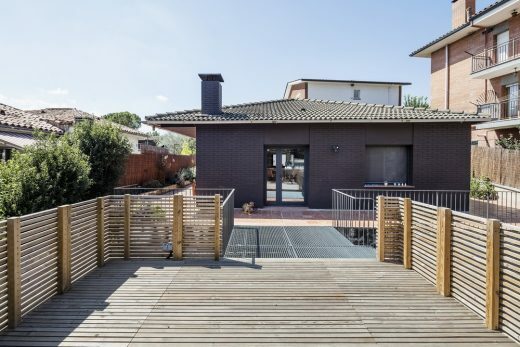 All in all, with a simple volume and the simplicity of a new connection between the different levels of the plot we have achieved the total renovation of the previous building, and also got a pleasant house to live. 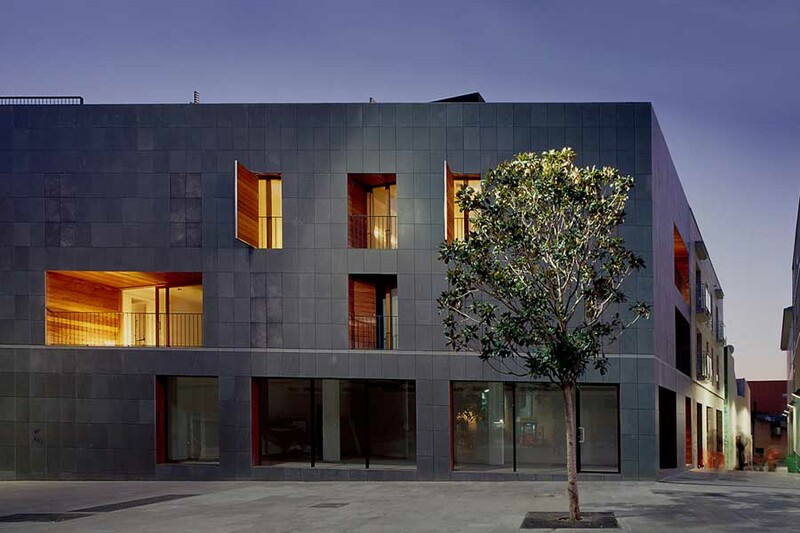 Wood Exterior Carpentry: Soldevila S.L. Facade, platform, false ceiling, wooden table and shelf: NixProfusta S.L.